What's in your winter weather car kit? Being stuck during a snowstorm can be a nightmare. Nobody expects to have car problems in a severe snowstorm, yet in Canada it's possible to find yourself stuck in the middle of nowhere and have to fend for yourself until help arrives. A winter weather car kit with necessary supplies can mean the difference between getting hypothermia or frostbite and being rescued within minutes. We've compiled a list of the essentials to include in your kit. Cell phone with charged battery. Pick up an inexpensive prepaid cell phone and keep it in your glove compartment in the event that you don't have a phone, or the phone you are carrying runs out of batteries. Have emergency numbers programmed into the phone. Warm extra clothes and boots. Have enough extra clothing for you and your family. Take old clothes that you would normally throw out or donate, and put them in your kit. You will also benefit from an emergency blanket, which packs light and can keep you warm in sub-zero temperatures. GPS and/or maps. A GPS system is the idea way to locate yourself and find an exit route, if your vehicle works. It will also help you direct emergency vehicles to your location. Given that technology is prone to failing, a simple road map is a good contingency. Shovel and sand/salt. If your vehicle is stuck on ice, some digging and a bit of sand/salt may be just what you need to get out. Traction mats. Traction mats are key in any winter weather car kit. Slip them in front of your tires and you may find yourself magically unstuck. First-aid kit. In the event that you or someone else is hurt, a first-aid kit is essential. Munchies. To increase your body temperature and give you energy to last the hours it may take to be rescued, be sure to include a large supply of non-perishable food in the car. A jumbo package of trail-mix can go a long way, as will granola bars, juice packs and bottled water. Self-starting booster kit. A set of booster cables will be helpful in winter, but what happens if you can't find another vehicle to help you out. A number of companies sell self-starter kits, which you pre-charge before putting in your car, and then are able to charge your car's battery to the point where it can start up again. Flares. Having a set of flares in your vehicle may seem like a bit much, but you never know where your car will seize up. If you find yourself in a remote area, it could be days before someone crosses your path. Avoid taking a chance by having a set of road flares in your winter weather car kit. Flashlights with batteries. If you find yourself stuck at night and have to dig yourself out of a patch of snow, you will want a flashlight in the car. Be sure you have a set of charged batteries to ensure you don't lose light when you need it. Ice scraper. 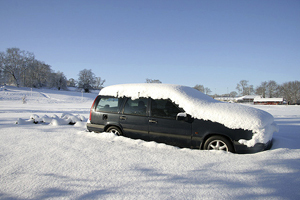 Even if you manage to dig yourself out after being stuck, you will still need to drive your car! Without a scraper to keep your windows clean, you won't get far. Taking into consideration these tips and investing in a winter weather kit, you can rest assured that you won't be caught unprepared. How can I prevent basement flooding? When should I contact my insurance company? Do you know how to check your driving record? How can I save money on my car insurance? How can I save money on my home insurance?